Building your custom mountain style home is an exciting process, but requires expertise, time and knowledge to make your project successful. That’s why we've created our unique Total Home Solution®. This proven, beginning-to-end approach combines award-winning design, flexible construction solutions, and BidRight, our exclusive competitive bid process, to deliver the highest quality home at the best price. Before you commit to constructing your home, you will have a design you love, at a well defined cost, and a builder that you are confident in. Explore Your Style! Timber Frame Homes: Our clients can choose from a variety of timber frame home styles. Whether building full timber frame structures, hybrid log and timber frame homes or just incorporating decorative timber frame elements, timber frame houses are growing in popularity. Mountain Accent Log & Timber Frame Homes: Get the look and feel of traditional log homes and timber frame homes without the necessity of building a full log or timber structure. Handcrafted Log Homes: Nothing compares to the beauty and artistry of a handcrafted log home. Our handcrafted log homes are typically designed with full hand hewed log walls, ridges, trusses & purlins. Each log is individually selected, hand cut and intricately placed. Milled Log Homes: Our choice of milled log home profiles and diverse selection of smooth and hand hewn surfaces provides creative freedom during the design of your unique log home. Post and Beam Homes: Exposed cross beams. Rustic, handcrafted log posts. Stately yet elegant timber frame. For hundreds of years, post and beam construction has been used to create one-of-a-kind homes. Still today, many prefer the unique look and feel of a post and beam home. Over the past 20 years, PrecisionCraft and Mountain Architects have designed and built an eclectic mix of post and beam homes across the United States. Got questions about log home maintenance or styles? 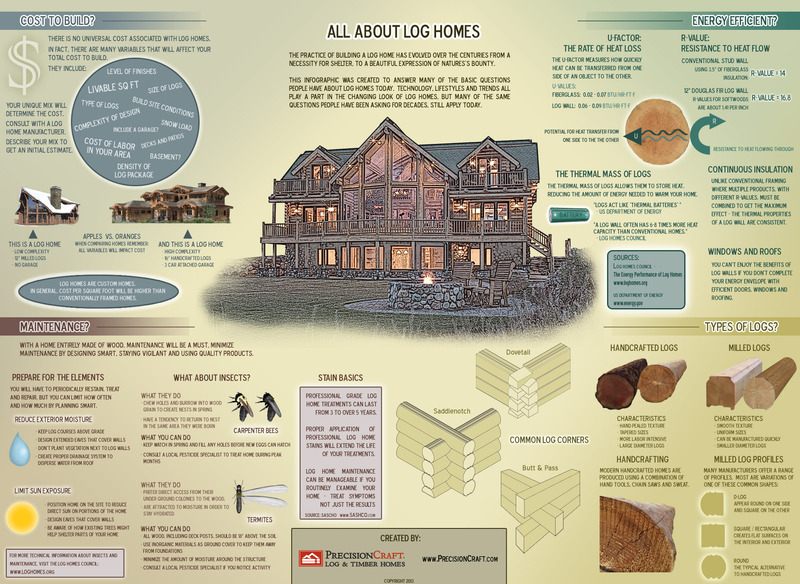 PrecisionCraft Log and Timber Homes just released a fun and informative infographic entitled, “All About Log Homes” that will help answer your basic questions! Building a Log Home, Away From Home. When you first began to dream of your getaway log home, you probably had some idea where it might be located. Maybe you had a piece of land already picked out or maybe you were looking for a mountain setting or a lot near a lake. No matter where you chose to build, it is more than likely that your dream log home will be located somewhere other than the town, city or even state you live in now. In an interview with Log Home Living, Jim Young, President of PrecisionCraft Log Homes gives his advice to future log home owners on buying land. This interview, packed full of good land buying tips, is featured in Log Home Living's 2010 Annual Buyer's Guide. Below is the original interview in its raw format. No, but I enjoy helping others realize their dream homes! Welcome Jennifer, nice to see you have joined this community. Although new, it is already taking shape and some interesting issues are being discussed; it will be great to get your perspective.